Well, that was fast. On Tuesday, President Obama addressed Cubans about the importance of human rights and peaceful dialogue. 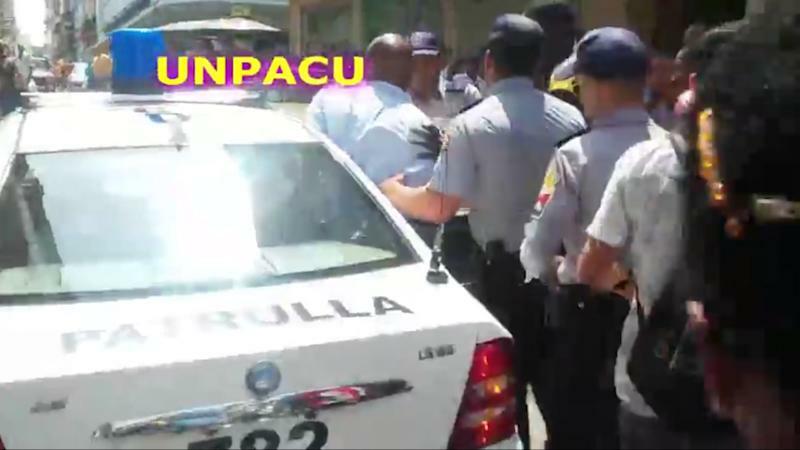 On Thursday, pro-democracy demonstrators in Havana were beaten and arrested by Cuban police agents just steps away from where Obama had spoken. The demonstration occurred three blocks from the Grand Theater of Havana, where Obama spoke live to the Cuban nation, and was swiftly broken up by plainclothes officers, who attacked demonstrators violently and then stuffed those they had captured into police cars and swept them away within moments. This reporter witnessed the brutal arrests of two demonstrators during the midafternoon eruption of public dissent in one of the most public forums in the city. According to witnesses, a small group of demonstrators had entered a park on San Rafael Street, the most popular of Havana’s newly opened Wi-Fi hotspots, where hundreds of people were busily connecting to the Internet or placing international calls over VOIP services. It is unclear how many participated in the demonstration or were arrested; attracted by a loud, angry crowd that had formed on one of the city’s principal avenues and was filming the arrests, I arrived on the scene too late to see the original incident but witnessed part of the aggressive police response. As hundreds of Cubans flooded into the park, perhaps more than 60 raised their cellphones and recorded a rough, even vengeful series of arrests. One protester I witnessed appeared to be running away from the police response as muscular men in guayabera shirts chased him down, pinned him to the ground and then punched him repeatedly in front of hundreds of their fellow citizens as well as foreign tourists and this reporter. A female demonstrator was dragged to a police car and quickly removed from the scene, although a large crowd appeared to pursue the police car for more than a block, filming the arrest. “They were shouting pro-Obama slogans and saying things like ‘Down with Fidel,’” said an Australian tourist who was standing on San Rafael Street when the incident began. He described a curious but passive crowd gathering around a small group of active demonstrators, who marched toward the Grand Theater, scene of Obama’s unprecedented live address to the Cuban nation. Protesters handed out small pamphlets — “a little bigger than a dollar bill,” the Australian witness said — before police agents swept in. The papers were cleaned off the street as quickly as the demonstrators were. The sight of dozens of cellphones raised overhead to record the incident and the police response did not deter officers. According to Elizardo Sanchez of the Cuban Human Rights and Reconciliation Commission, Cuban police have been retrained in recent years to use less visible tactics when responding to dissent, including physically isolating and gently removing demonstrators. None of that was visible on Thursday. Plainclothes officers punched and kicked a defenseless man who had already been pinned to the ground by another officer; screams could be heard as another demonstrator was dragged into a police car that accelerated dangerously in the crowded street. “Watch out,” a tall, powerfully built Cuban man shouted to people around him. “There are more police than not in this park.” He was referring to plainclothes officers who often monitor public gatherings in Cuba. Moments later, at least six Cuban police cars roared to a stop at the park, disgorging uniformed officers whose presence rapidly reestablished a sense of order. The number of Cubans watching quickly fell by half. Many Cubans have been unwilling in the past to express direct political opinions in the face of police enforcement and government demands to conform to a predetermined political agenda. But many remained on the scene, filming with their phones even as the area returned to normal. “There are no secrets anymore,” said Reinaldo Escobar, an anti-government dissident and publisher at 14 y Medio, an independent online newspaper for Cubans. In an interview later, Escobar said he had not heard of the afternoon demonstration on San Rafael Street, but he reported a separate incident in the morning in which pro-democracy activists had been arrested on the steps of Cuba’s capitol.